Um, Hi! This is a request from SF Epvjupa that I put off far too long. I’m afraid it’s not the best, but any attempt I made at replicating it wasn’t as good as the original. 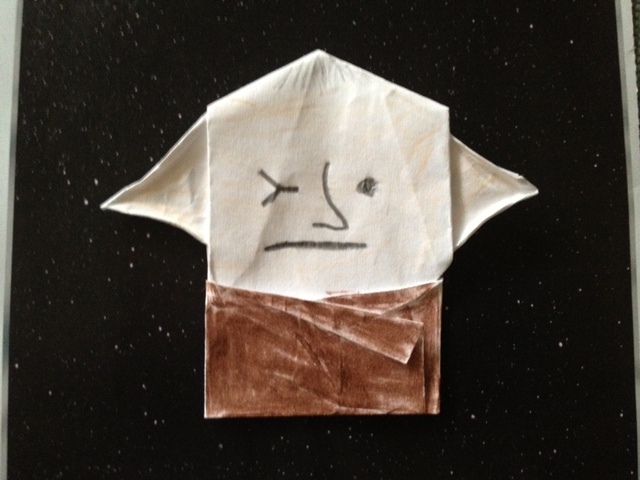 STOOKY man that’s ausome can you make a Kawahata Yoda? Afraid not. I tried, and failed most epicly. Nope. I’ve tried and failed in the most epic of fashions. No, more like Admiral Ackbar with Soapy’s ears and a pointed head. Perhaps. Really not much different from a universal puppet. You could probably figure it out yourself. Don’t worry Um Hi Guy! It’s awesome! I have a Saesee Foldiin to go with it and origami Plo Koon. 1st comment! yes! I love it! ANOTHER not very popular jedi has been folded! Yay! my origami Plo-Koon is not alone!